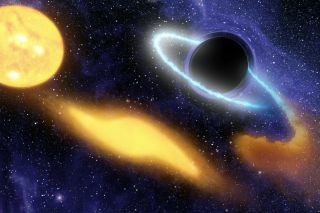 An artist's concept shows a black hole eating material from a nearby star. Researchers say its possible dark matter swirling around a black hole could radiate gamma rays that could be seen by telescopes. Dark matter circling the drain of a massive black hole could radiate gamma-rays that might be visible from Earth, according to new research. Dark matter is five times more plentiful in the universe than regular matter, but it does not emit, reflect or absorb light, making it not just dark but entirely transparent. But if dark-matter particles around black holes can produce gamma-rays (high-energy light), such emissions would give scientists a new way to study this mysterious material. Jeremy Schnittman is a theoretical astrophysicist at the NASA Goddard Space Flight Center, and he's beginning a project to look through data from the Fermi Gamma-ray Space telescope for signs of high-energy light around the edge of a black hole that might have been created by dark matter. "We're really just getting started on this part of the problem," Schnittman said. "As a theoretical astrophysicist, I haven't done a lot of data analysis in my career, so it's a little bit of a learning curve for me. But fortunately I'm surrounded by people here at Goddard who are real experts at the Fermi data." Schnittman's search for this dark-matter signal began with a computer program that he has been developing for about 10 years. It models in 3D the paths of particles as they zip through space near a black hole, while some of them get close enough to orbit around the black hole or fall in. Just over a year ago, he decided to adjust the program to model dark-matter particles. The resulting video shows how the subatomic bits get caught up in the gravitational pull of the black hole and swirl around it in a region called the ergosphere (where all particles must orbit in the direction of the black hole's spin). Some of the particles collide and destroy each other (also known as annihilation), and this produces a pair of gamma-rays. These particles of light might normally fall into the black hole, helpless against its gravitational pull, were it not for something called the Penrose process. In 1969, astrophysicist Roger Penrose showed that if two photons are created very close to a black hole, it's possible for one of them to escape, while the other falls in. This flies counter to the commonly held idea that nothing can escape from a black hole, or at least nothing that goes past the "event horizon" — the point at which the gravitational pull is so strong that nothing, not even light, can ever exert enough force to get away. According to the Penrose principle, the particles are not created beyond this point of no return, but under normal circumstances, it's unlikely that either particle would have any means of getting away from the black hole. So the Penrose process still changes the fate of at least one particle, giving it an escape route. In 2009, a group of researchers showed that the Penrose process could be applied to dark-matter particles that annihilate and form two gamma-rays. If dark-matter particles are annihilating near the surface of a black hole, telescopes on Earth could detect the escaping gamma-rays. Schnittman's work using the 3D computer model has shown many more paths that the particles can take, including some that are more likely to produce gamma-rays that can escape the black hole, and with even higher energies than had been previously predicted. A brief description of those results was published in the journal Physical Review Letters last December, and a longer description of the work has been accepted to the Astrophysical Journal. With those results, Schnittman and his colleagues are now looking for this signal, although they said they expect it to be very dim compared to many other gamma-ray sources. The researchers are creating a list of target galaxies that have few gamma-ray sources and very massive black holes. "The bigger the black hole, the bigger the signal," Schnittman said. "It scales in a way that as your black hole [mass] goes up by a factor of 10, the expected signal goes way up, by something like a factor of 1,000. A 3D computer model of what the dark-matter gamma-ray signal might look like around a black hole. Because the particles are orbiting around the black hole (left to right) the signal is only visible on one side. The particles that escape the black hole via the Penrose process not only go free, but they also leave with more energy than they started with. In fact, they have more energy than the pair of particles had combined. This, it would seem, is a free lunch. Since Penrose's original work, scientists have shown that not only does the escaping particle steal energy from its partner (essentially pushing off the other particle), but it also steals energy from the spinning black hole. Every Penrose particle that escapes slows the spin of the black hole by a very, very tiny amount. Schnittman said he is reserved in his hopes for finding a dark-matter signal in the Fermi data. Not only will it be difficult to see such a small signal amid the noise of gamma-rays in the universe, but the existence of the signal also relies on a major unknown: whether or not dark-matter particles create gamma-rays when they annihilate. The fact is, scientists don't know what dark matter is made of, and they don't know if dark-matter particles will annihilate in the way that Schnittman's model predicts, if they do so at all. So if Schnittman did find a signal, it would mean a major breakthrough in the study of the nature of dark matter. "That's Nobel Prize kind of stuff," Schnittman said. "It's a long shot, but it would be a tremendous payoff if we found actual confirmation of dark-matter annihilation." Editor's Note: This article was updated to correct the following error: Roger Penrose's original paper about the Penrose process was published in 1969, not 1971.